Human beings often presume our own worldview when trying to make sense of a message or a text. As anyone who has had an argument based upon a misunderstanding knows (think of Abbott and Costello’s “Who’s on First?” routine), assuming that other people mean exactly what you think they mean, without making sure that’s what they say they mean, often becomes an exercise in frustration. The same is true with written texts. Many times modern Christians come to a text such as the Bible and assume that the worldview they hold is precisely that of the specific Bible passage they are reading. While this may (rarely) be the case, more often than not readers of the Bible bring their own presuppositions without even knowing that they differ from those of the Biblical authors (and, by extension for those of us who believe in the inspiration of scripture, different presuppositions than God). This means that reading and interpreting the Bible without seeking to understand the context of the Bible leads to a distorted interpretation of the Bible. And since I would hazard to guess that few people desire to purposefully misinterpret the Bible, it seems important to seek a contextualized reading of any Biblical text. One important difference between our worldview and that of the Biblical authors is that of cosmology. Cosmology is the branch of philosophy dealing with the origins and structure of the universe. Essentially, cosmology involves how you think about what the world and universe look like and function. Obviously, modern science has influenced modern thinking about the universe. For example, when I think about the world, I conceive of a spherical planet revolving around a star that is within a galaxy of billions (and trillions?) of other starts, that is in an expanding universe full of galaxies and wonderfully beautiful images captured by the Hubble Space Telescope. Please note that I’m not suggesting that you adopt a fully ancient cosmology in your own life, nor am I advocating the modern view of the universe that entirely separates that natural and supernatural. Instead, I submit to you a cosmology that balances the wisdom of the Ancient Hebrew model with the insights of modern thinking. This cosmology recognizes the vastness of the measurable physical universe while holding that the physical is not the entirety of reality. And it affirms that the totality of a person does not exist as some radically divorced form of spirit/soul and body, but as a created whole. Thanks, Jacob. This is all so peacefully and non-confrontationally said. Whenever I point this out, people immediately start roaring about evolution because everyone knows I think we evolved. I shared this post on FB, and I didn’t mention evolution. Hopefully, it won’t come up, but instead my readers will catch the points you were making, not assume points they imagine I am making. Thanks for your comment–I too hope that people will take this post on its own merits. Thanks for all your continued work on difficult questions! Thanks for sharing this, Jacob. A helpful and concise introduction. Plus, that visual is amazing. Thank you Jacob, for your work, and thanks also to Paul, who posted this article and made me aware of it. This is going to be used in a Bible study I am helping with, explaining and reconciling the Bible to people who have no historical knowledge beyond last week’s newspaper. Many thanks for helping bring light to a dark world! 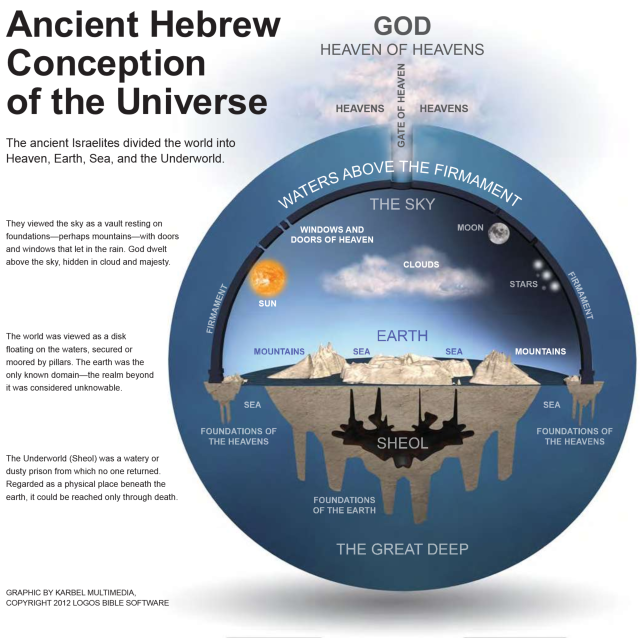 I found this article very interesting, given that the Hebrews integrated a lot of religious concepts within the real world, in which the underworld is literally the underworld and the heavens are just above the sky. I wonder how they interpreted the change from day to night, and if Sheol is where oil comes from.